I came across an article recently in my Fine Cooking Magazine that detailed 25 Kitchen Tools that they could not live without. Situated amongst the Mandoline, Mortar and Pestle and the Steamer Basket (all things I do not have and can comfortably live without) were the Vitamix, Food Processor, Tongs, and Non-Stick Pan. 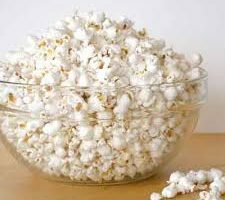 These items are must have’s in my kitchen, so I thought I would compile my own list of my top 10 Kitchen Items I can’t live without. 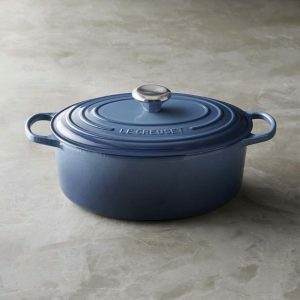 My Dutch oven from Le Creuset is one of the items I purchased that finally made me feel like a grown up. This pot is the workhorse. You can make noodle, soups, braise meats and sautee. If I could only have one pan on the island – It would be this. For a non-stick non-Teflon coated non-toxic pan I am all about the scan pan. 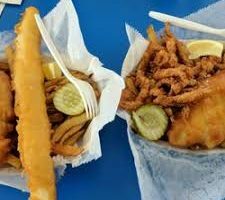 When you cook with it, you do need to lay down a base of oil or fat of some kind but from there – it is perfectly no stick. Again, you need a blender so why not make it the best that actually heats up and makes the soup too. If you are a smoothie or saucy person – invest – you won’t be sorry you did. Here is an easy cilantro chimichurri recipe to try in your Vitamix. This was a wedding gift from my best friends parents, and it gets used a lot. Slice potatoes for scalloped potatoes, mix pizza dough, blend pesto, chop nuts – The Cuisinart can do all these chores fast. 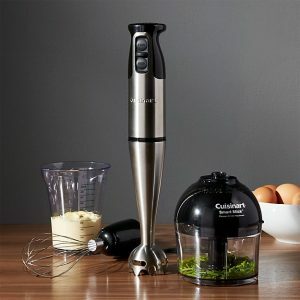 I make lots of soups and when you want a quick whirl to thicken a bean soup or a squash soup – the handheld immersion blender makes quick, clean, work of it. Whip cream or mix up frothy milk for a latte or blend the yolks and mayo for deviled eggs too. PS don’t get a cheap one. You really need the strength of the blades to make this tool worthwhile. Click here for an easy homemade Mayo recipe that is so easy with this tool. Need I say more? As long as its seasoned and treated right it could be the only pan, you will ever need. It can act nonstick, and it goes from stovetop to oven effortlessly. Nutmeg, Hard Cheese, Citrus, Ginger, Garlic, Onion can all be zested onto a dish tableside or over the pan. I zest, and this has replaced my larger grater for almost all chores except grating large cheese shreds for nachos, macaroni, and cheese, etc. Storage, Broth or soup containers that go from freezer to microwave to fridge. Beans, Rice, Peppercorns, spices, lemon juice or grated ginger all have found their way into a Mason jar at my house. I like the way you can label them with a piece of tape and how orderly they are in the freezer or in a cupboard. If you are a person that brings lots of salads or soups to work these can be a game changer and you can also shake mile in them for a quick frothy latte. I cut herbs and chicken breasts as well as other stew meat cuts with sheers. No Knives are needed for these tasks. 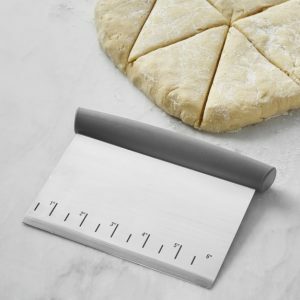 If you work with pizza or cookie dough, the bench scraper helps it all come together and enables you to make quick work of cleaning of the countertops. You can also use it to gather chopped items and scrape them into the pan forming a very versatile tool.